Pope Francis will travel to Panama City on Jan. 23 to join more that 150,000 young people from 155 countries, including Venezuela, El Salvador, Nicaragua, Honduras, Cuba, Argentina and the United States at the 14th international World Youth Day. The pope chose this small country with a population of over four million people (89 percent of whom are Catholic), on the isthmus linking Central and South America, to host this year’s gathering because it is the only country in the region with good infrastructure, security conditions and a thriving economy able to host such an event. Panama, a presidential republic, shares borders to the west with Costa Rica and to the southeast with Colombia and is washed by the Caribbean Sea to the north and the Pacific Ocean to the south. It is the first W.Y.D. to be held in Central America and offers the possibility for tens of thousands of young people to attend from the countries in this region of 180 million people, many of which states are hit by violence, poverty and emigration. This year’s W.Y.D takes place less than three months after the conclusion of the Synod for Young People that was held in the Vatican last October, the final document of which was published in English recently. 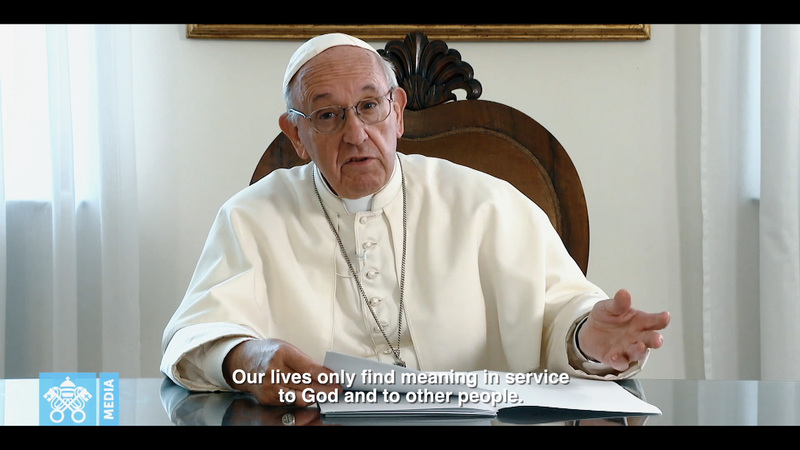 Pope Francis sees the W.Y.D. in Panama as being in direct continuity with that synod. He also views it as a prelude to next October’s Special Assembly of the Synod of Bishops for the Pan-Amazonian Region because, for the first time ever, a pre-W.Y.D. meeting of more than 1,000 young people from various indigenous peoples from different parts of the world was held at Soloy, in the Panamanian diocese of David. It is the first W.Y.D. to be held in Central America and offers the possibility for tens of thousands of young people to attend from the countries in this region of 180 million people, many of which states are hit by violence, poverty and emigration. Their presence would have been unthinkable if the W.Y.D. was held far away. Thus, 7,000 people have come from El Salvador and 400 from Cuba—the largest numbers ever at a W.Y.D. from these countries. They will join 2,000 young Argentinians from the pope’s homeland and 2,000 more from the United States, as well as 3,500 from Poland (the largest contingent from a European country). Notably, few Chinese will be present, notwithstanding the recent historic agreement between the Holy See and China, for two reasons: the high cost, and the crackdown on young people participating in any religious event in the mainland, which has made it difficult to publicize W.Y.D. there. It is worth noting that this is only the fifth W.Y.D. to be held on the American continents since John Paul II convened the first one in Rome in 1985. The other four were held in Buenos Aires (1987), Denver (1993), Toronto (2002) and Rio de Janeiro (2013). All the other W.Y.D.s, except Sydney, which was held in 2008, have been held in Europe. The next World Youth Day is expected to be held in Portugal, although that has not been officially confirmed. Some 25 million young people will have participated in these 14 international W.Y.D.s at which successive popes have attended—John Paul II, Benedict XVI and now Francis (and many millions more have joined the 20 annual local church youth days held between the international events since 1985). To guide the gathering on a path to a fuller Christian life, Francis has chosen as its motto a distinctly Marian theme: “Behold I am the handmaid of the Lord. May it be done to me according to your word” (Luke 1:38). W.Y.D. Panama is Pope Francis’ third W.Y.D., after Rio and Krakow. This also marks his 26th journey outside Italy and the 40th country the pope has visited. Panama is a small country, in a small region that is on the periphery of the world. It is his first visit to this land, where 65 percent of the population are identified as mestizos, 12.3 native Americans, 9.2 black, 6.8 mulatto and 6.7 white. He is the second pope to visit this country, after John Paul II. The Argentinian pope will be accompanied by three cardinals—Pietro Parolin, the Secretary of State, Marc Ouellet, president of the Pontifical Council for Latin America and Kevin Farrell, Prefect of the Dicastery for the Laity, the Family and Life, as well as the Venezuelan archbishop Penna Para. The Dicastery is responsible for putting on W.Y.D., along with the local church. The new Vatican media team, Paolo Ruffini, Andrea Tornielli and Alessandro Gisotti, will accompany the pope, along with 70 journalists and a special guest of the pope, Dominque Wolton, Director of the Communication Sciences Institute at the National Centre for Scientific Research in France, with whom he has done an interview book: A Future of Faith: the Path of Change in Politics and Society. After a 13-hour flight, Francis will touch down at Panama’s Tocumen International Airport, where he will be welcomed by the country’s president, bishops, 2,000 faithful and a troupe of dancers in traditional Panamanian dress. The pope will then make his way to the nunciature in Panama city, where he will reside for the rest of his visit. On the morning of Jan. 24, he will deliver the first of 10 discourses in Spanish at the Presidential Palace for the official state welcome ceremony. There, he will address an audience of 700 persons that includes the civic and military authorities, representatives of civil society and the diplomatic corps. In his speeches, he is expected to address not only the poverty and violence in the region, but also the dramatic issue of emigration. He will point to the martyr archbishop, St. Oscar Romero, as a model of Christian life that young people can draw inspiration from. The church community in El Salvador had hoped he would come to their country and pray at Archbishop Romero’s tomb, but he decided against that. Some sources indicate that the violence in the country may have been a key factor, but this has not been confirmed. After greeting the authorities, Francis will walk from the palace to the nearby church of St. Francis of Assisi to meet and address the bishops of SEDAC, the organization that brings together the bishops' conferences of Panama, El Salvador, Costa Rica, Guatemala, Honduras and Nicaragua. It was the first such episcopal organization in the world. Later that afternoon, more than 100,000 young people will welcome him to W.Y.D. during a 90-minute celebration in the Campo Santa Maria La Antigua, located along La Cinta Costera, the palm-tree lined coastal beltway that extends along the entire bay in front of the Pacific Ocean. The next day, Jan. 25, Pope Francis will drive 30 miles by car to the town of Pacora, east of Panama city, to visit 192 young inmates of a juvenile detention center in Las Garzas de Pacora. There, he will lead a penitential liturgy and, for the first time, hear confessions in the center, at confessionals made by the detainees. It will be “a moment of consolation and hope” for these young people deprived of their liberty, Alessandro Gisotti, the interim Vatican press spokesman, told reporters at a briefing on the eve of the visit. On his return to Panama City that Friday afternoon, Francis will participate in the celebration of the Way of the Cross along the Cinta Costera. The W.Y.D. cross, which has been carried across the globe every year since 1985, will be given prominence throughout. In his speeches, he is expected to address not only the poverty and violence in the region, but also the dramatic issue of emigration. He will point to the martyr archbishop, St. Oscar Romero, as a model of Christian life that young people can draw inspiration from. On Saturday morning Jan. 26, Francis will consecrate the altar of the colonial-style cathedral basilica of Santa María La Antigua, whose origins go back to 1608. Radically restructured after an earthquake in 1882, the basilica is home to the revered image of Santa María La Antigua, the patroness of Panama, which the Spanish conquistadores brought to this land in 1501. It represents the Madonna with a child in her arm and a rose in her hand. After dedicating the altar, Francis will celebrate mass for the congregation of priests, consecrated men and women and lay movements. He will no doubt recall how the Good News of Jesus first came to Panama with the Spanish conquistadores in the 16th century, and the first missionaries to come here were Franciscans, followed by the Mercedarians, the Dominicans and then the Jesuits in 1583. Afterwards, Francis will drive from the basilica to the major seminary of San Jose where, as is a W.Y.D. tradition, he will share a meal with 10 young men and women from different nationalities. Francis will then drive 15 miles from the nunciature to the St. John Paul II field, Campo San Juan Pablo II, otherwise known as Metro Park, which holds up to 700,000 people, for a 90-minute-long youth vigil of music, song, prayer, reflection and speeches, including testimonies from a family, a former drug addict and a Palestinian. Pope Francis is scheduled to speak last. On Sunday morning, to avoid the heat of the day, the Jesuit pope will celebrate an open-air Mass at that same venue at 8:00 a.m. for a congregation that is expected to fill the park. After Mass, he will go to La Casa Hogar El Buen Samaritano, which the local church established in 2005 to help victims of AIDS who lack any familial or economic help. He will meet approximately 60 of them. After that, he will return to the nunciature to bid farewell to the staff there, and then drive to the Rommel Fernandez Juan Diaz stadium to thank the 26,000 volunteers who have worked for the W.Y.D. From there he will drive to the airport for the 13 hours return journey to Rome, during which he will give a press conference. Six days later, Pope Francis is scheduled to hit the road again, this time to visit the United Arab Emirates for the first time.